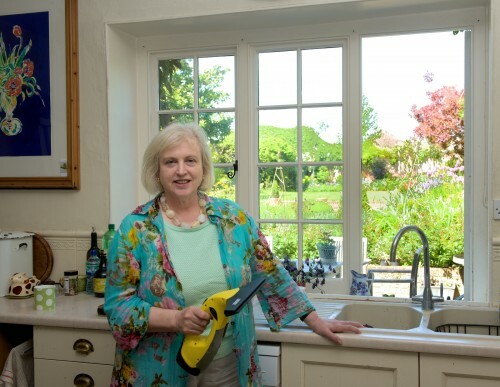 How much time can you save with the Karcher Window Vac? Cleaning windows is a chore. It takes time, and it’s boring. But if you want to enjoy your garden, you need clean windows. And if you want your greenhouse or potting shed to let in lots of sun for your plants, those need to be clean too. 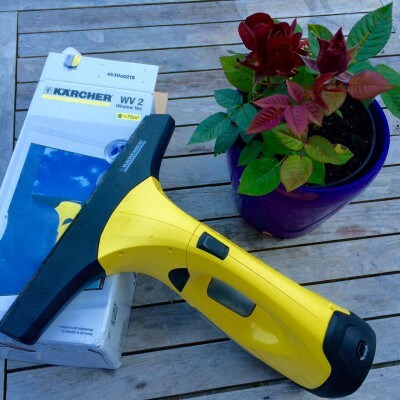 When the Karcher sent me their Window Vac WV2 to review, I decided to see whether it could save me time and effort. 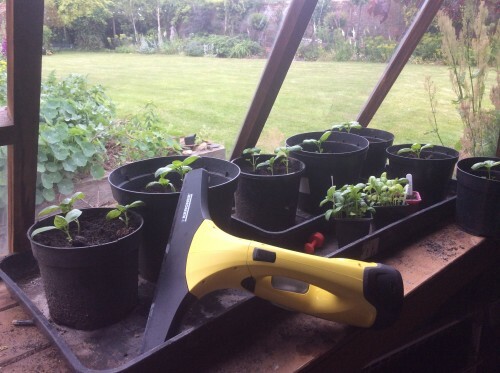 I tested it out on the four windows of the potting shed. The potting shed windows need regular cleaning – kind birds and stuff dropping from the magnolia tree above it ensure that. I tested two panes with Karcher WV2 and two with my normal spray and wipe. 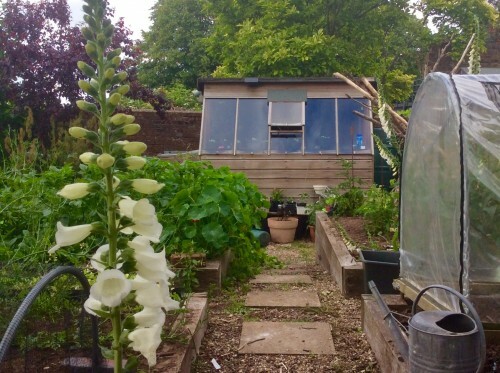 The two windows on the left – looking at the potting shed – were cleaned by the WV2. The two on the right were cleaned as I usually clean windows – with a window-cleaning spray and a slightly damp cloth. 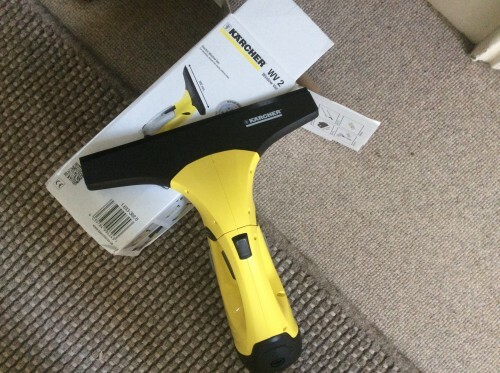 The Karcher Window Vac WV2 has two clip-on heads – one for smaller panes, although the second head didn’t come with my WV2. If you need the smaller head, you’ll need to make sure your purchase includes it. The head clipped on easily. Then I charged up the battery, and was ready to go. If you buy the Premium Window Vac WV2, it also comes with a bottle of Karcher Window detergent and a special applicator. However, my WV2 was the standard model, so I sprayed my usual window cleaning spray onto all four windows. I then filled the WV2 with water from the tap, and was ready to go. I started by cleaning the windows as I normally do (these are on the right when you’re looking at the shed, but appear on the left in my video). I had to rinse and wipe several times to get the window cleaning spray off, and it was difficult to avoid smearing. I timed how long it took me to clean each pane – around 40 seconds. After cleaning with a window spray and cloth, a ray of sunlight shows that there is a distinct smeariness about the window. On the other side I used the WV2. It cleaned the windows to sparkling in just over 10 seconds. 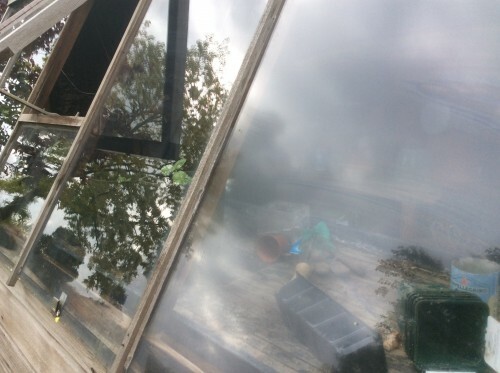 In a four window potting shed, this may not sound like a big saving, but if you have a greenhouse, that’s a lot of glass to clean. 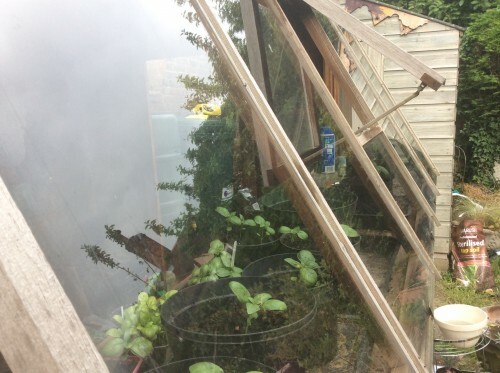 Comparing my potting shed to my friend’s greenhouse(only a little bigger, but all glass), I reckon you’d save 10-15 minutes every time you cleaned the glass. And, because it’s easier, you’d probably do it more often, which would be good for the plants! What I was most surprised about, however, was that there was a very distinct difference in the finish. Glass is very difficult to photograph, and I didn’t think I’d be able to show the effect of Karcher vs spray and cloth. But the slight smear on the spray-and-cloth window can be clearly seen. Ready to clean the kitchen windows with the WV2. Photograph by Lisa Valder. I also used the WV2 on our traditional Georgian windows. The panes are a little small for the standard head – the smaller head would have been useful – but I was still able to clean the window by wiping the WV2 sideways rather than up and down. The WV2 was comfortable to use, solidly built and easy to hold. I will be using it more often, especially in the house, where we are far too lazy about our windows. If you’d like to see the Karcher vs cloth test in action, do check out my video here. And for more about the Karcher WV2, see the Karcher site here.